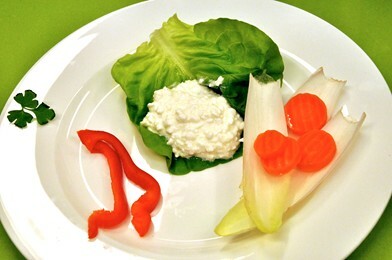 Take your measured amount of cottage cheese (protein portion); leave out 2 tsp to eat first. Place the remainder in a food processor with 1 to 2 tsp of onions (shallots or spring onions), blend well. Spread / dip on celery sticks, cucumber, broccoli, cauliflower, asparagus or other vegetables on your personalized metabolic balance® plan.